Do you love Yorkies? Then you will love this mug! Is your dog your best friend? Show your love for your furry friend with one of these gorgeously irresistible fine bone china doggy mugs. These will make an ideal gift for any Yorkie fan. They also hold a lovely cup of tea. The mug comes in a beautiful locally sourced box, with the Dimbleby Ceramics logo, making it ideal for a special gift. 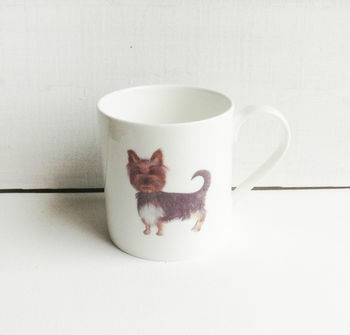 A unique design by Rachel Dimbleby, taken from an original watercolour painting of a Yorkshire Terrier, it will make you smile everytime you make a cuppa. Made from the best English Fine Bone China. 90mm high x 120mm wide including the handle. The top of the mug is 80mm from edge to edge, all measurements are approximate.